There are about 40,000 bean varieties in the world, and only a small fraction of these is cultivated for regular consumption. And even here you can find many bean varieties, you've never tried. Among the most popular beans for consumption are soybeans, green beans, white beans, black beans, black-eyed peas, chickpeas, lentils, kidney beans, pinto beans, lima beans. Have you tried all of them? Beans are a very important source of protein and fiber (including soluble, that helps lower blood cholesterol), low in fat and high in complex carbohydrate, iron and folate. The USDA recommends eating at least 3 cups of beans a week, and that is about 3 times more than an average American does. 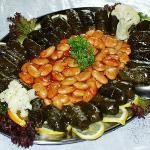 Why don't you cook today a healthy and tasty bean dish? White bean dip would be perfect for a party, and a hearty bean soup or vegetable-bean stew would be the best for dinner. Cook new dishes today to celebrate National Eat Beans Day.